The Maldives are renowned for having calm, gin-clear waters with outstanding visibility and pleasantly warm temperatures, making them one of the best places in the world for snorkeling and scuba diving. 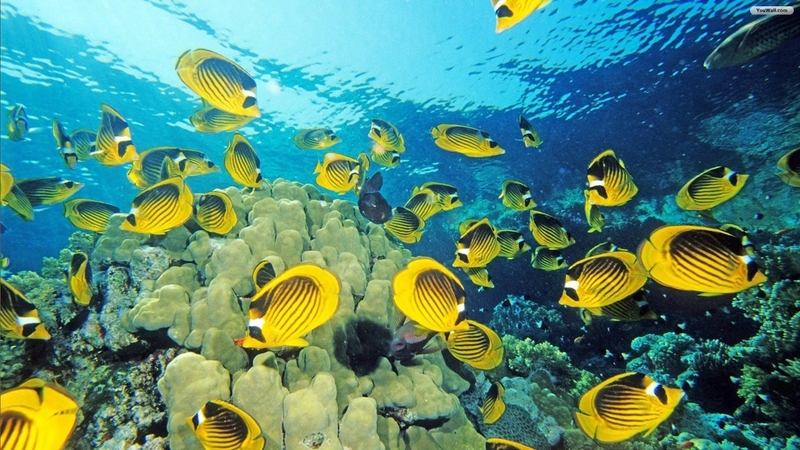 With 26 geographical atolls and more than 1,200 islands, many of which are surrounded by reefs that teem with brightly colored fish, and other marine life, the Maldives doesn’t disappoint when it comes to finding a fantastic spot to jump into the water with a mask and snorkel and explore the awe-inspiring world beneath the ocean’s surface. There is an amazing diversity of marine and sea life in the Maldives archipelago with pristine reefs filled with exotically colored corals, and over 2,000 species of fish, ranging from vivid little reef fish that dart in and out of the corals to black-tipped reef sharks that cruise languidly along the reef drop-off. Other sea creatures that call the Maldives home are dolphins, manta rays, moray eels, eagle rays, stingrays, turtles, and the magnificent whale shark, the largest fish in the ocean. 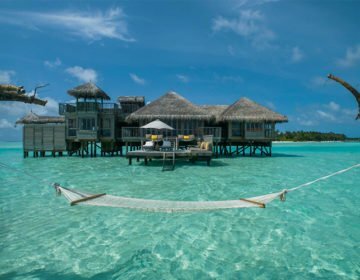 The Maldives is home to a myriad of luxury resorts and deluxe seaside hotels that offer a wealth of amenities and activities, with snorkeling and scuba-diving being at the top of the list. Most of the resorts are situated on islands that are surrounded or within very close proximity to one or more reefs, which can easily be explored at leisure. With so many incredible places to choose from in these beautiful islands, here are a few of the top resorts and hotels that offer exceptional snorkeling and scuba diving opportunities that are a cut above the rest. Nestled on the edge of Hanifaru Bay in the Maldives’ Baa Atoll island archipelago, Anantara Kihavah Maldives Villas is an idyllic slice of tropical heaven from which to explore the amazing underwater world of the Indian Ocean. Set on one of the most pristine Maldivian islands, Kihavah Huravalhi, the luxurious resort is reached by a 30-minute seaplane flight from the Velana International Airport, which is an unforgettable experience in itself as the plane flies over palm-fringed islands with white sandy beaches and luxurious resorts, and the shimmering, turquoise ocean. The luxury retreat features 80 spacious pool villas nestled along a pristine stretch of beach or poised over the water with private plunge pools and sweeping ocean views. 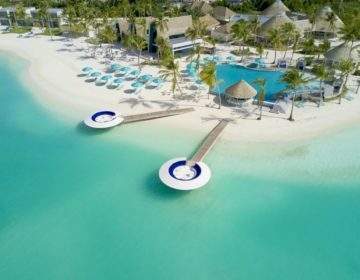 Guests can choose from six exquisite dining and entertainment options, including an award-winning underwater restaurant and wine cellar and enjoy an array of deluxe amenities and activities from an exclusive spa, with yoga and meditation sessions to cooking classes, star-gazing, and elemental water sports. Hailed as one of the top resorts in the world for unrivaled diving and snorkeling, Anantara Kihavah Villas is renowned for the incredible density of marine life that can be found on the resort’s house reef and offers scuba diving and snorkeling experiences second to none. The resort is not only home to a pristine house reef, which is a reef that is close to the shore of the island and easily accessible, but also has a professional team of divers with a resident marine biologist who is on hand year-round to take diving and snorkeling experiences to another level. Set within a UNESCO World Biosphere Reserve, the waters around Anantara Kihavah Villas resort boast an abundance of pristine reefs and brightly colored corals that teem with life. Turtles, eels, reef sharks, nurse sharks, and a wealth of small and large fish of unimaginable hues call these naturally formed marine sanctuaries home, while just off the reef drop-off and slightly further offshore, there are dolphins, manta rays, eagle rays, stingrays, turtles, and behemoth whale sharks. Anantara Kihavah Villas’ Dive Centre offers a variety of diving and snorkeling-related services for guests who want to make the most of the spectacular surroundings. The center provides a range of PADI diving courses from certification courses for beginner divers to Rescue Diver for scuba experts, orientation dives with certified instructors, and a unique Coral Adoption Program, a long-term plan designed accelerate the regeneration of coral growth in the atoll reef to ensure the future of this incredible Maldivian destination. Dive into the deep at this amazing resort by booking here. The only resort in the Laamu Atoll and reached by an inter-island plane trip from Malé International Airport and a short boat ride, Six Senses Laamu is a palm-fringed paradise encircled by a spectacular house reef and coral garden that offers unparalleled snorkeling and diving experiences. Another one of the Maldives’ top resorts for snorkeling and diving, the island is also home to the Maldives’ most famous surfing wave breaks, Yin Yang, where it is very common to see schools of dolphins frolicking in the waves. 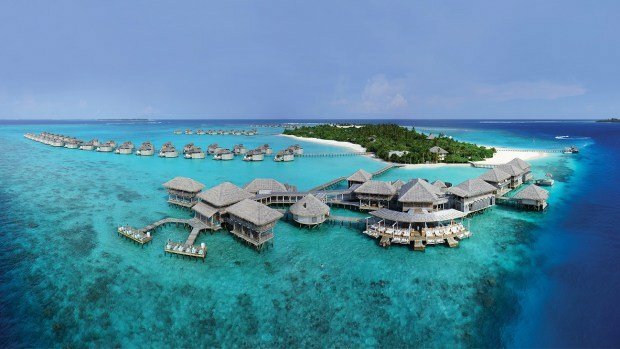 Six Senses Laamu boasts a combination of beautifully appointed on-land and over-water villas constructed of sustainable materials and offering unfettered ocean views. Thatched Crusoe-esque villas have contemporary décor, luxurious living spaces and deluxe extras such as glass sunken bathtubs, treetop decks, and private plunge pools. The resort also has the most significant over-water facility in the Maldives with five elegant lounges and restaurants with endless ocean views and where nothing is spared from an ice cream station, a chocolate room, a wine and cheese cellar, an award-winning Asian restaurant, and a unique zero-carb restaurant, which uses local produce grown in the island’s organic gardens. An array of amenities and activities can be enjoyed from pampering spa and body treatments, surfing the atolls most famous waves at Yin Yang, exploring the neighboring Hithadhoo Island on island-hopping excursions, or relaxing with a picnic on an uninhabited palm-fringed island surrounded by shimmering turquoise waters. Six Senses Laamu is surrounded by pristine and untouched hard coral gardens with a diverse variety of fish and marine life that can be experienced by snorkeling, and manta rays, sting rays, barracudas, Napoleon wrasses, turtles, sharks, and whale sharks in deeper waters. The resort’s professional and multilingual dive team provide a variety of water-based experiences for all levels of swimmer, snorkeler, and diver, from guided snorkeling trips to exhilarating instructor-led night dives. Laamu Atoll is a diver’s paradise with crystal-clear, warm waters, excellent visibility, unspoiled, vibrantly colored corals, underwater gardens, and millions of fish. 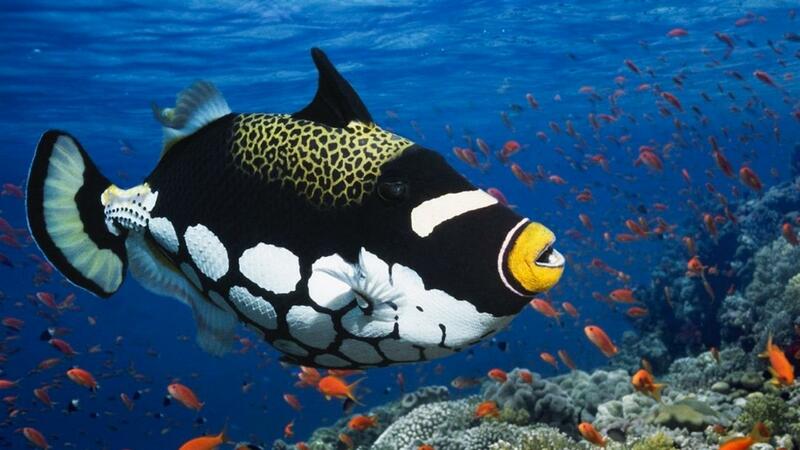 Favorite dives sites include Reef Dives, Kandus, and Thilas, which are some of the best dive spots in the country. One-of-a-kind diving experiences are offered, such as early morning and sunrise dives, full day diving excursions on a dive boat, which venture slightly further afield, and heart-stopping night dives, where nocturnal marine creatures come out to feed. 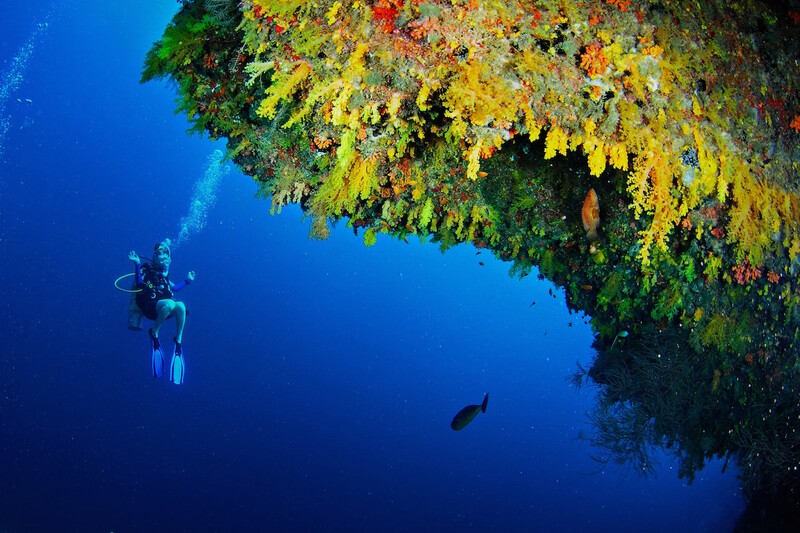 Head to this diver’s paradise in the Laamu Atoll by clicking here to book your spot. Set on a small private island in the North Malé Atoll, Baros Maldives is a tropical oasis ringed by a footprint-free white sandy beach, a spectacular house reef, and azure waters. Reached by a short speedboat trip from Malé International Airport, the award-winning boutique resort offers a tranquil and secluded escape from the hustle and bustle of daily life with a full complement of luxurious amenities and facilities, unforgettable water-based experiences, and exceptional and discreet, personalized service. The small leading luxury hotel Maldives resort features tastefully-designed beach and water villas with thatched roofs and cool sandstone walls, open plan living spaces kissed by warm sea breezes, open-air bathrooms and manicured gardens, secluded terraces and sun decks, and private plunge pools with breathtaking ocean views. Three elegant restaurants and two stylish bars offer seaside or over-water dining, and sunset cocktails and dinner on a luxury dhoni while sailing on gentle sea breezes is the perfect romantic treat. Luxurious amenities, facilities and unrivaled experiences at the resort range from indulgent massages and spa treatments at the award-winning Serenity Spa, stylish seaborne experiences and sunset cruises on the exclusive 52-foot motor yacht, Serenity to traditional Maldivian fishing excursions and seaplane flights above the atoll for sensational photographic opportunities. One of the top resorts in the Maldives for snorkeling and diving, Baros Maldives is renowned for its astoundingly beautiful house reef that is so close to the shore it can be enjoyed by both beginners and experienced snorkelers. The resort has a first-class marine center that provides guests with an array of over and underwater experiences, including guided house reef tours, which feature a relaxed 20-minute class about the marine organisms that might be seen. 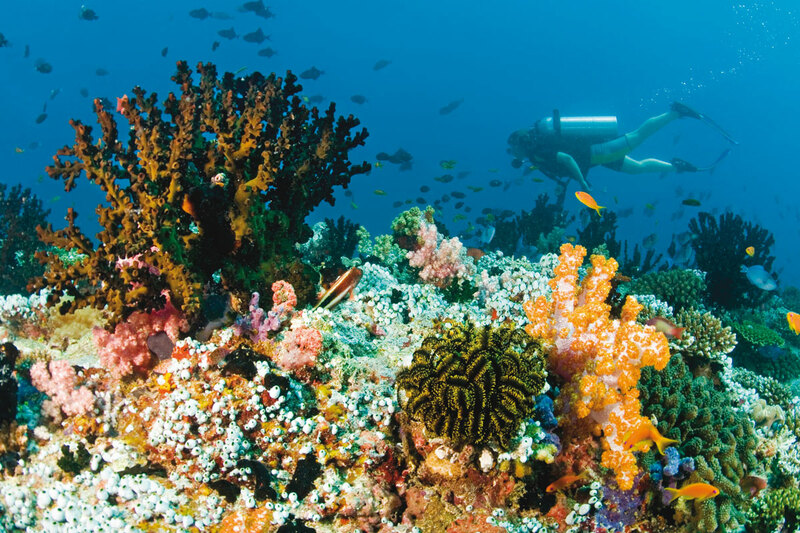 Other opportunities range from boat-based snorkeling safaris led by the resort’s expert in-house marine biologist, private snorkeling lessons, night snorkeling trips, and tailor-made snorkeling experiences on the house reef or further afield by boat. 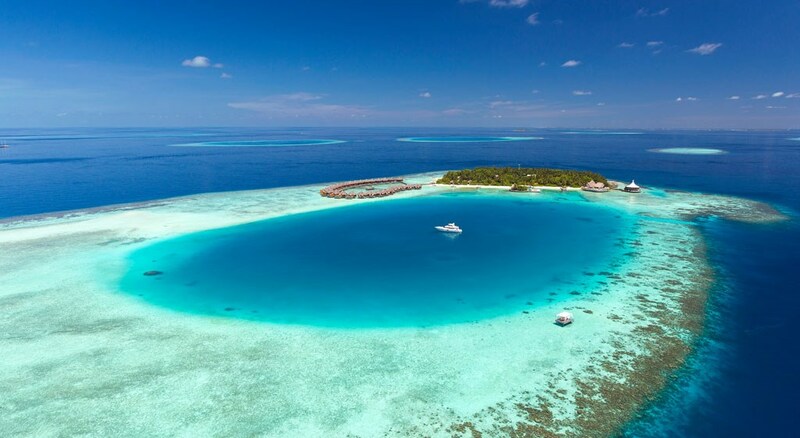 Help save the coral with a diving holiday at Baros Maldives. Book here. 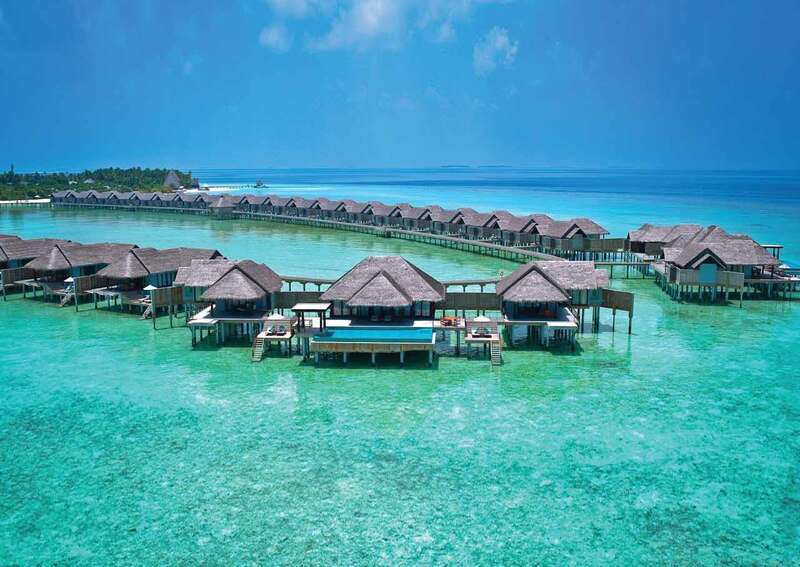 Nestled at the south end of the Maldives on the heart-shaped Meradhoo Island in the Gaafu Alifu Atoll, Jumeirah Dhevanafushi Maldives Luxury Resort stretches across two islands with lush tropical vegetation, gin-clear waters, and palm-fringed white sandy beaches. Accessed by a 55-minute flight from Malé International Airport followed by a 15-minute speedboat ride from Kaadedhdhoo Domestic Airport, the oceanside paradise sanctuary features island and over-water villas with contemporary décor, private outdoor marble plunge baths, and unrivaled ocean views. 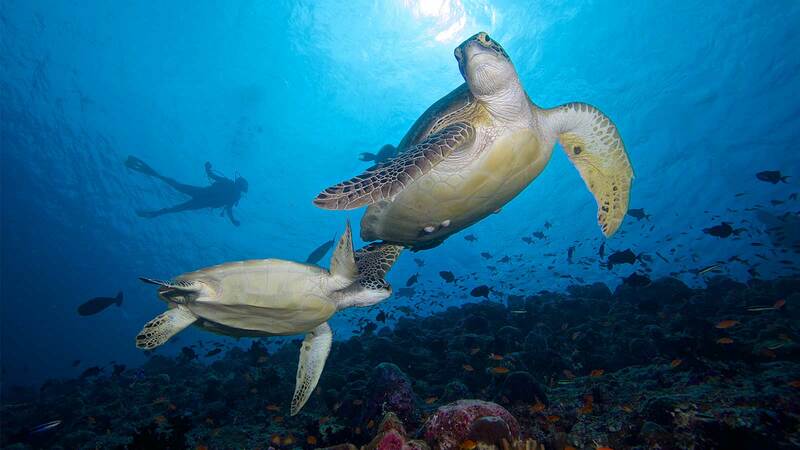 The two entrancing hideaways of the resort are separated by a 0,5-mile stretch of the sparkling ocean surrounded by 2.5 miles of spotless house reefs that provide an underwater experience with breathtakingly beautiful coral gardens which teem with turtles, fish, and other marine creatures. Jumeirah Dhevanafushi Maldives Luxury Resort boasts exquisitely appointed beach and over-water villas with chic, contemporary décor, high ceilings, and floor-to-ceiling windows and sliding doors that seamlessly blends interiors with the outside, outdoor marble bathtubs, and private plunge pools just a few steps from the lagoon. The resort’s stunning beachside restaurant and bar are set in the sand with the Indian Ocean as a spectacular backdrop for the just-as-spectacular cuisine, and signature cocktails served. An array of exceptional amenities and facilities include pampering massage and body treatments, fitness classes, and various water sports and underwater experiences. 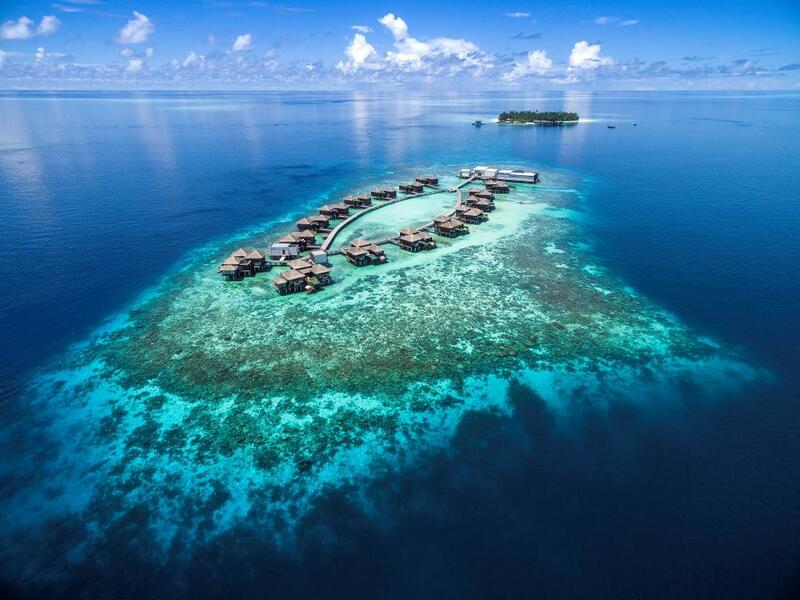 Jumeirah Dhevanafushi Maldives Luxury Resort has recently launched a new underwater snorkeling experience that makes it one of the top resorts in the world for unrivaled snorkeling and diving. Situated in an idyllic and secluded location at the southernmost tip of the Maldives, Jumeirah Dhevanafushi takes guests on an ‘Underwater Snorkeling Adventure’ experience like no other. Led by an expert marine biologist, the adventure offers guests the chance to discover some of the world’s rarest, largest and most beautiful coral reefs and explore a kaleidoscopic world bursting with diverse marine life. They will also have the opportunity to learn more about the importance of ecology and preserving the reef through an animated presentation by the marine biologist and a unique reef-cleaning program. 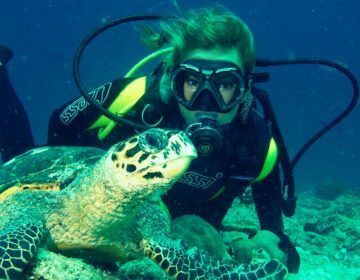 The resort’s PADI-certified Meradhoo Dive Center also offers a range of scuba diving course for beginners through to advanced, as well as specialist courses such as Rescue Diver. Enjoy an ‘Underwater Snorkeling Adventure’ experience like no other by booking here.